Businesses are becoming more customer-centric out of necessity. Today’s market leaders succeed by placing a premium on customer delight and retention. Companies that listen and respond to feedback retain more customers and win in the marketplace. CX transformation starts with creating internal alignment — customer happiness must become the top priority. But rallying the troops is only half the battle. Listening to customers is more challenging than ever. 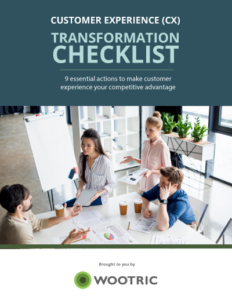 Download this free guide and start improving customer experience today.